Structure made of wood laminated pine timber autoclave-treated with non-toxic salts and protective panels in bi-laminate pantographed HPL without sharp edges. Components: N°1 turret with wooden poles section cm 9x9, platform (falling height cm 150) in multi-layer birch wood glued with phenol formaldehyde resin with non-slip knurled surface and finished with a coloured overlay film on both side, decorative HPL panels and tubular bars in painted galvanized steel in the upper side of the structure, protective bi-laminate HPL panels mm 8, small bench in multi-layer birch wood glued with phenol formaldehyde resin with non-slip knurled surface and finished with a coloured overlay film on both side. Dim. cm 100x100x360h; N°1 access stair with lateral support panels in bi-laminate HPL mm 15 and steps in multi-layer birch wood glued with phenol formaldehyde resin with non-slip knurled surface and finished with a coloured overlay film on both side. Two lateral protection panels in in bi-laminate HPL mm 15, as handrails. N°1 slide H cm 150 in rotomolded coloured high-density polyethylene connected to the structure through bi-laminated HPL panels mm 15. N°1 Tic Tac Toe game activity panel. 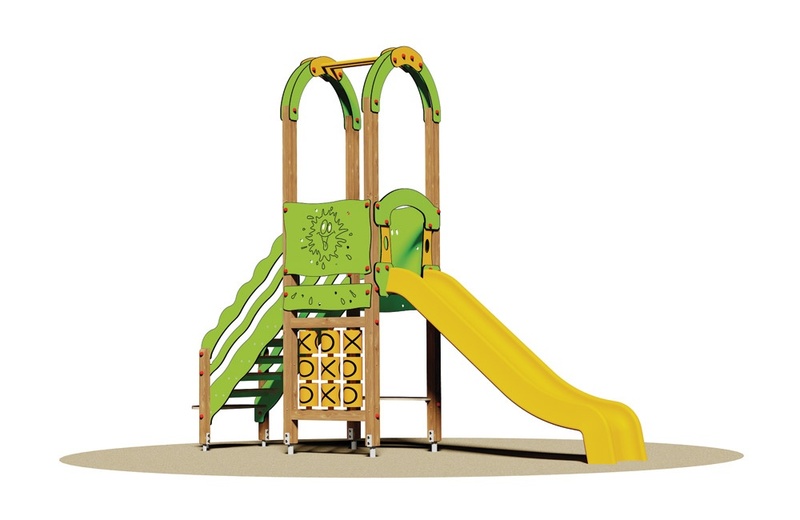 All wooden parts are treated with high-coloured penetrating stain, non-toxic wax-based water-soluble. Assembly system with 8.8 galvanized steel bolts and self- locking nuts. Coloured nylon cap nuts as required by law. Polyethylene pole caps. Hot-dip galvanised metal brackets for ground anchoring system in a concrete plinth or version to be fixed on the floor.